The Googleplus super star Guy Kawasaki has a new book out. This time he’s teamed up with Shawn Welch an app developer and book writer from Cambridge, MA. It is available on Amazon for instant download. I was lucky enough to get an advance copy of this book which I read over the weekend. First let me say that I am already a fan of HOW-TO books. I am the type that ONLY reads to get information on HOW-TO do something. I don’t get into fantasy novels or other time wasting reads. I’m all about trying to do something important and I read to get instruction on HOW to do it. 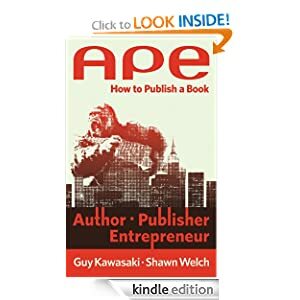 This new book, APE teaches you How-To publish your own ebook. It doesn’t just give you an extra long bullet list either. This is a comprehensive step by step guide on how to develop, review, and publish your own book in the 21st century. It provides everything that you should be thinking about, planning, and avoiding. Awesome quotes that are very relevant and memorable. Discusses fundamental theory and practical concepts without boring you to sleep. gives you the successful writers perspective and point of view. Reinforces the value of independence. Tells you specifically, who makes how much of a traditional book deal. Identifies the important members that you need on your team. Undervalues Shiitake. If someone wouldn’t give you one of these delicious mushrooms then maybe what you are offering is not worth it. There are things that I would give a Portobello but not a Shiitake depending on what’s being negotiated. Sorry if I lost you on this one, you’ll have to read the book or follow Guy K on Googleplus to get this point. Missed the point on eBook privacy. The privacy concern isn’t about the point made in the book. It’s about who monitors what you do and the fact that you never get to know who these people are or what they monitor or WHO they share your info with. The computer he recommends writers use. I bought one for my wife and she hates it. I think you can save money and get a $500 laptop that will do the same job extremely well. Step by step action plan of what to do to get published traditionally or electronic. If you knew better you would do better. This book gives you every major consideration that successful writers think of and also what they do about it. It’s like being a fly on the wall during a successful book launch. Uncovered valuable partnerships and paths to build for success. Its not just about what to do but HOW to do it and who to do it with. Learn what partnerships you need to develop in order to become successful. Shows love to others with “dofollow book links” and real ones too. They say the best way to get a referral is to give one. Well, Guy K gives tons of shout outs to some very key individuals and links to important websites. If you are someone who like to learn from the best then this is invaluable information. Support for buyers with a free resource website. It’s awesome the free stuff that he gives away with the book. He is basically trying to prime the pump and encourage you to get started writing your first ebook. Download Free Word.doc book template files and more, its awesome. Spills the beans on who’s who in the world of publishing. Get this book if you want to know who are the decision makers and big players in the industry. Guy is someone who loves to show love to people who have helped him now you get to know who they are and maybe just maybe they’ll help you? Demonstrated how best selling writers network. (bunch of back scratching mothersuckers lol) It’s not who you know it’s who knows you. It’s also how you get to be known. This book lays it all out for you just pay attention. 4 GEMS that GUY and Shawn Dropped in this book. Sorry dudes I’m keeping them. The 5 activities successful Entrepreneurs have to do well at the same time. This tip alone is a reason to buy the book. 3 magic price points of eBooks. People struggle to find the right price for their own published work. This is very important and it’s included. How professionals prepare. The exact number of books that Guy buys and reads in research to writing his latest titles and how many books he reads per year. Surprised me. Power tip. How Guy gets feedback from millions of friends in early development of his books. Summarizes the tools successful writers should be using. Reviews the process of deciding who to write for. Warns you of what NOT to do and who you should NOT hire to help you with your book. Identifies the hardest step in the book writing process and how to over come it. …And much more if you have this book please share your feedback here, do you agree with my review? What did you like/dislike about APE? Mr Jackson – this is a classy way to run a list my friend. Just how it should be, no affiliate hits, no BS, just silence from you until something like this pops up in my inbox. Just bought it Darnell, I hope the link went through for you. This is classy, and a million miles from all that Warrior Forum bumblestuff. I’m actually enjoying being on your list, can you believe that? Ha haaaaaaaaa! Thanks for the feedback Jeff I really Appreciate that man. I just finished reading the book..It’s really informative and has loads of useful tips..A good read. Yeah it’s like all you ever need to know about self publishing I’ve read some other books but this one is the best around and it’s cheap. great work by admin, and this all site are really very popular, so all your visitors will get good info by this post. 2 Pings/Trackbacks for "APE Review – 20 reasons why you should read the new book by Guy Kawasaki and Shawn Welch"